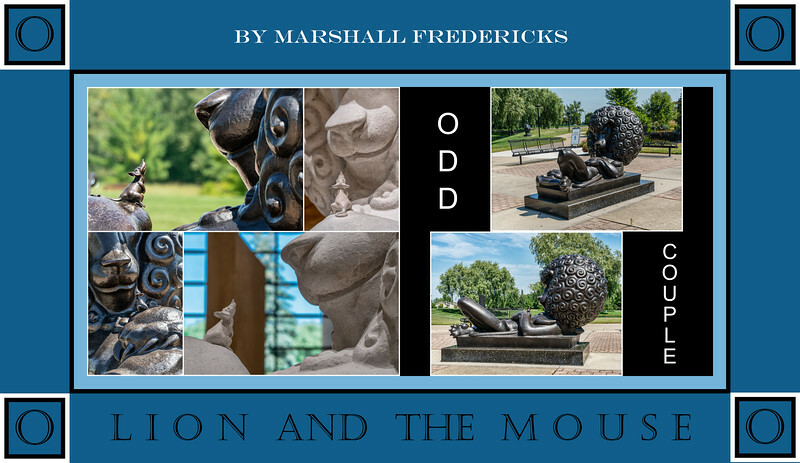 This sculpture of what in nature would be a very odd couple, indeed, is Marshall Fredericks’ interpretation of one of Aesop's Fables, ‘The Lion and the Mouse’. Most descriptions of Fredericks’ depiction emphasize the ways in which he modeled the lion to be as child-friendly as possible, which was consistent with its purpose as a featured work at the Eastland Center shopping mall in suburban Detroit. Even without knowing the connection to the fable, in which the tiny mouse is able to save the life of the lion which had previously spared its life, a viewer must surely enjoy the whimsy and gentle humor of this piece. The photos are of the bronze cast version (in the Sculpture Park) and the plaster original in the Marshall M. Fredericks Sculpture Museum on the campus of Saginaw Valley State University. The Odd Couple, brings back memories of the film based on Neil Simon's play and the TV series that followed with Tony Randall and Jack Klugman. Good choice for O. Excellent montage for O. I somehow missed seeing this one. Wow, you've posted some amazing O shots and this one is no less amazing than the others. Well done. Unbelievably clever "O"! Love it! I would not have thought of this "O", very creative.